Malkin and her good friends are protecting the Vietnam War memorial from... well, I'm not quite sure but they support the troops! 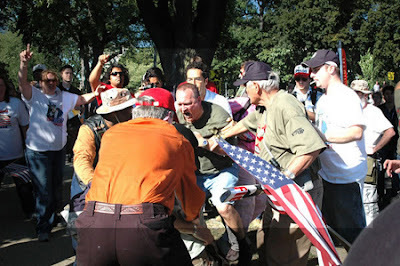 Here they are stomping on the father of a dead soldier, Carlos Arredondo. As Carlos passed counter protesters, one man ripped a picture of Alex from the memorial. Carlos leaped on the man to retrieve the picture. It was at that point that approximately five others all began to attack Carlos by kicking him in the head, legs, stomach and back. Semper Fi Carlos, Semper Fi. Oh, did I mention in addition to being the father of a dead Marine, Carlos was brown.